Stir to punch down; add oil, honey, gluten and salt. Mix to blend; add 2 cups flour and turn mixer on low. Add flour by 1/2 cupfuls until dough cleans the sides of the bowl and is no longer sticky. Knead on low speed 6- 8 minutes. The flour amount is approximate, use only enough flour to cause the dough to pull away from the sides of the mixer bowl. Do not add more flour. Let dough rise in covered bowl 30 minutes until doubled. Punch down dough place on oiled counter and divide into six pieces. 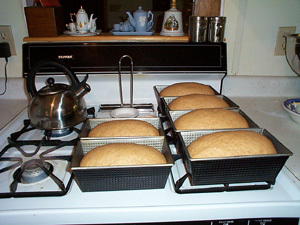 Form loaves and place in greased loaf pans. Let rise in warm oven (turned off) until 1 1/2″ above the rim of the pans. With loaves still in oven, turn oven on and bake at 350 degrees for about 30 minutes. Remove from oven and cover with clean towel to soften crust. Per Serving : 113 Calories; 2g Fat (18.6% calories from fat); 4g Protein; 21g Carbohydrate; 3g Dietary Fiber; 0mg Cholesterol; 61mg Sodium. Exchanges: 1 Grain(Starch); 0 Lean Meat; 1/2 Fat; 0 Other Carbohydrates.